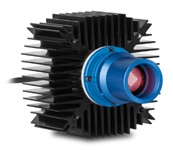 Our high-power LED pattern projectors push the light output of LTPR LED pattern projectors to extremely high values, making these products the solution of choice for 3D measurement of large objects. Thanks to the illuminance these projectors can be used as a viable alternative to laser line generators in high-speed, on-line, linescan camera-based applications. The high power can also be used in order to decrease system sensitivity to ambient light, for example, to perform 3D mapping of objects with illumination levels found in typical working environments. This light is available with 3 watt LEDs, to include: white, 460 nm blue, 520 nm green, or 630 nm red. Input voltage is 24 VDC. A variety of interchangeable optic patterns are available. Choose from standard line, stripe, edge and grid patterns, or specify the custom pattern ideal for your project.